Until there’s a cure . . .There is only Care! My primary training is in The Positive Approach to Care, developed by Teepa Snow. Teepa’s slogan is, “Until there’s a cure, there’s care.” This trips nicely off the tongue and seems too obvious to be profound, but there is so much more meaning in this statement than we might see at first glance.I had this brought home to me recently when I had the opportunity to attend a two-day Alzheimer’s conference in Orlando. I came away feeling quite unsettled, for two reasons. First, we heard nothing very optimistic about the state of research for a cure. The more research we conduct, the more questions – not answers – we seem to uncover. I did not see even a glimmer of that hoped-for cure at the end of the tunnel. The second reason was that I heard so little about care. There were some really good workshops about care techniques and resources available to caregivers, but there seems to be so little attention, and money, directed toward the development of an art or science of better care.Here are some of the things I believe should receive more attention and funding. I want to see more research into the behavioral psychology of individuals living with dementia. Can we learn more about what motivates their behaviors and thereby learn ways to serve and communicate with them more effectively, compassionately, and less disruptively? I want to see money spent on research into compassionate techniques of care such as hug therapy and humor therapy. We know they work. How can we better understand and develop them so more caregivers know how to apply them? I want to see research into kinder and gentler non-pharmaceutical, wholistic methods of mood management. The psychotropic drugs currently used were never intended for dementia, and sometimes they bring more problems than solutions. I want to see publicly-funded dementia hotlines, manned by volunteers who have received extensive training in understanding the personality and behavioral changes that people with dementia experience. These skilled facilitators would be on hand 24/7 to de-escalate difficult situations in the home. I want to see States raise the minimum standards of care required for professional providers. These have not been updated in 15 years! I want to see more funding for public and private-sector agencies to provide workshops for family caregivers since many of us will never be able to afford professional care. Finally, I want to see the creation of learning institutes devoted entirely to the science of better care. Through these, we can produce a whole new generation of young, compassionate medical professionals who understand they are dealing with people, not a disease. Debbie Selsavage is an Independent Certified Trainer in the Positive Approach to Care, a Certified Dementia Practitioner, and President of the Alzheimer’s Family Organization. Her company, Coping with Dementia LLC, is dedicated to making life better for individuals and their caregivers who are living with dementia. Contact Debbie at deb@coping.today. Many assisted living owners fear that anything "new or additional" will add to costs, and thus damage the bottom line. Counter-intuitively, a study conducted at Stanford University demonstrated that consistent application of compassionate care will lead to higher morale, lower staff turnover, reduction in medication, better efficiency, and a better bottom line. Read it HERE. Regardless of its original intention, the Florida Baker Act has become detrimental, abusive, and harrowing to dementia patients. Read why HERE. 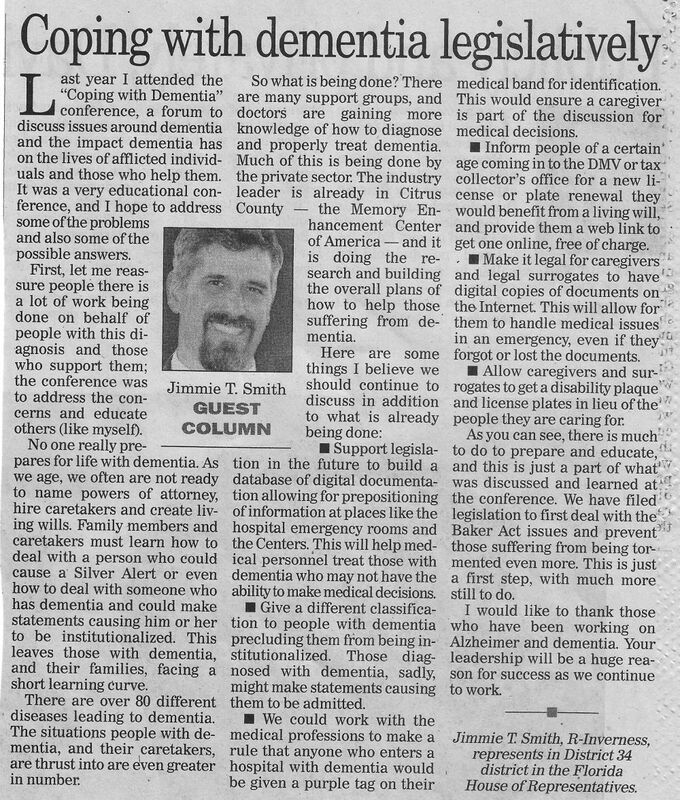 After attending the 2014 Coping with Dementia Conference in Homosassa, Assemblyman Jimmie T. Smith laid out a legislative agenda for better care and treatment for dementia patients and their families. To read his column, click HERE. "new normal" for dementia patients. To see a very interesting and enlightening video about an experimental care facility in the Netherlands, click HERE. His Holiness tells us it is important to surround dementia sufferers with affection, “because affection goes beyond words.” Read his thoughts on aging and death HERE. Multi-generational homes used to be common in America. With the rise of the elder care industry, more people live their final years only with people their own age, resulting in less diversity and less social stimulation. An ALF in the Netherlands shows it does not have to be this way by bartering housing for service to college students. Click HERE. If current trends continue, dementia victims and their families or care givers will control an ever-larger segment of the economy. It behooves businesses to become dementia friendly, not just because it is the right thing to do, but also because it is good business. Click HERE. Psychotherapist Peter Field summarizes the importance and benefits of kindness: “Kindness costs little but pays huge dividends in our own lives and in the lives of those we touch.” Read it HERE. Hernando Sun’s (Hernando County, FL) Shannon Gayton writes about Debbie Selsavage and Coping with Dementia LLC, stressing the importance of compassion in dementia care. Her article posted #3 for the topic on Google News. Read it HERE. When a person begins to lose their memory, can we retrain their brain? Resolving to become a less-stressed caregiver! Debbie Selsavage on Delusion versus reality!! Eileen Pontti on Delusion versus reality!! LT on Delusion versus reality! !